The world is already very familiar with the conventional single screen of laptops and personal computers. 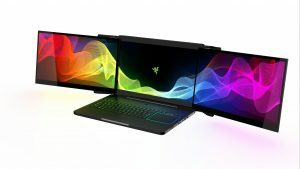 Now its time to show people something new and this initial step in evolution of a new technology has been taken by RAZER who is already very well known for peripherals and concept pieces. But this time RAZER has just amazed the world with the gigantic prototype of Project Valerie. One thing can be surely said about Project Valerie that it is going to be the milestone in development of multiscreening concept. 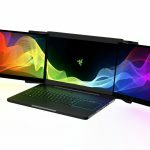 Project Valerie is a laptop with three 17 inch screens and is probably going to be the world’s first portable monitor with 3 built in adjustable screens. It weighs more than 11 pounds providing a 180 degree field of view and possesses NVIDIA G-Sync technology with 8GB RAM, accompanied by an Intel Core i7 Skylake CPU and 32GB RAM as a foundation it will be able to run HTC Vive and Oculus Rift VR headsets. In comparison to the typical thin lightweight laptops, it is somewhat a heavy one and due to its multi screens and high resolutions it requires a lot of battery consumption but due to the services it is going to provide, it’s all going to be justified. The users are going to have a new gaming experience on this gadget. Project Valerie is a prototype so far and therefore there is no discussion on the availability and pricing of the model yet.